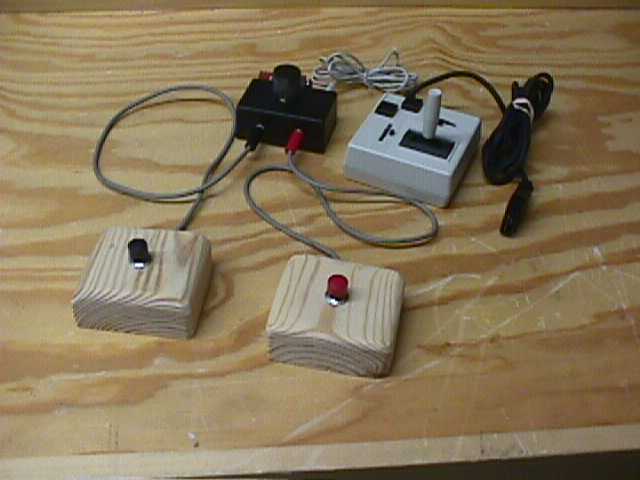 The purpose of this project is to modify a joystick to allow two buttons to replace the horizontal right and horizontal left motion of the joystick when it is used with a driving assessment computer program. the user should push the joystick left. When the right and middle square have the same color, the user should push the joystick right. The user should not move the joystick if the colors do not match. The fourth and last task is visual scanning. This task involves keyboard input and is not of concern as part of this project. 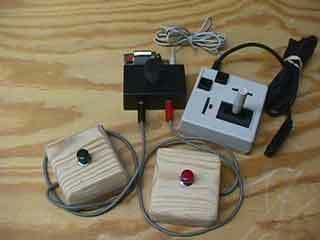 The addition of the switches to the joystick was the idea of the Occupational Therapist on the driving assessment team. One switch replaces left motion of the joystick, and the other switch replaces the right motion of the joystick. He felt that the computer was incorrectly grading some clients with severe motor impairment because they had difficulty moving the stick in the correct direction, and difficulty returning the stick to the neutral position before the computer started the next iteration of the task. His theory is by allowing these clients to use switch access, they will be graded on cognitive ability and their mobility impairments will not be a factor. It is important to note at this point that changing the method of input may have some effect on the validity of the test, and further research needs to be done on this. The first step was to determine exactly how the joystick operates. The joystick is attached to the 15 pin game port of the soundcard. The joystick contains two 100 k-ohm potentiometers (one for x-axis movement and one for y-axis movement) and two momentary contact switches for buttons "A" and "B". When the joystick is pushed all the way to the top left corner, the potentiometers are at their lowest resistance. For this project, a circuit was developed to output about 5 k-ohms resistance when the left button is pressed, about 95 k-ohms resistance when the right button is pressed, and about 50 k-ohms when neither button is pressed. The 50 k-ohm resistance needs to be able to be adjusted to calibrate the joystick switches to center each time it is used. To create the needed resistances, I used a 4.7 k-ohm resistor, a 47 k-ohm resistor, and a 100 k-ohm potentiometer. 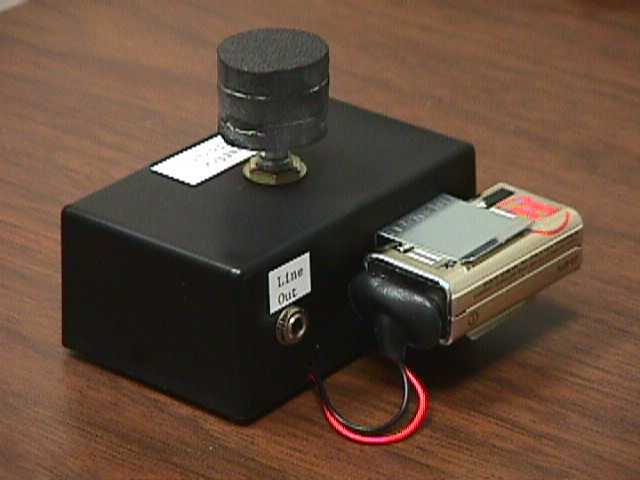 When the switch access is needed, the 100 k-ohm potentiometer is calibrated to about 50 k-ohms resistance for the neutral resistance. When the left button is pressed, the 50 k-ohms must be removed from the circuit and the 4.7 k-ohm is added. When the right button is pressed the 47 k-ohm resistance is added to the 50 k-ohm resistance to create about 97 k-ohms resistance (see image to the left). To switch the resistances in and out of the circuit, I decided to use SPDT relays. I used relays that switch on 9 volts so I could use a 9-volt battery to power the system, and not have to worry about drawing electricity from the joystick or computer. 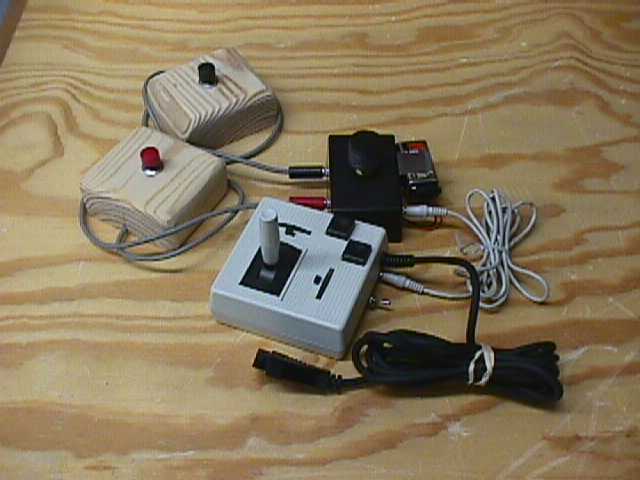 A DPDT toggle switch and 1/8 inch phone jack was added to the joystick to switch between the joystick's own x-axis potentiometer, and the switch access circuit. When someone wants to use switch access, they flip the toggle switch from "Joystick" to "Switches", and plug a 1/8-inch phone cord into the switch circuit box and the joystick. Any type of button or switch with a 1/8-inch phone jack can then be plugged into the switch access box. The program can then properly calibrate the switch access box, and the 100 k-ohm potentiometer can be adjusted accordingly. 1. Plug the joystick into the game port of the computer. 2. Plug a good 9 volt battery into the black switch access box. 3. 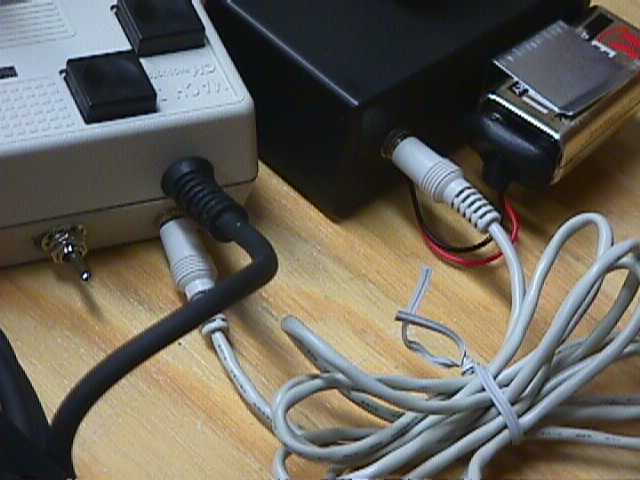 Plug a cable with 1/8 male phone jacks into the "Line In" female phone jack on the switch access box, and into the "Line Out" female phone jack on the joystick. 4. Plug two switches with 1/8 male phone jacks into the left and right button female phone jacks on the switch access box. 5. 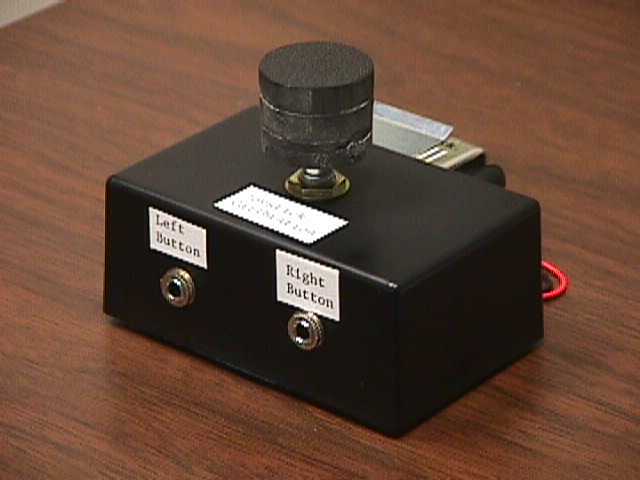 Flip the toggle switch on the joystick from "Joystick" to "Switches". 6. Start the assessment program, and run the joystick calibration part of the program. 7. Use the "Joystick Calibration" knob on top of the switch access box to center the dot on the screen. Make sure the dot is moved into the center, and has not just appeared there, as it will if the resistance output is to low. If the switch access box is not properly calibrated, the program will not recognize when the left button is pressed. 8. Start the assessment tasks. 9. When the assessment is done, reverse the first five steps to properly disconnect the switch access box. Remember to flip the toggle switch back to "Joystick" and disconnect the 9 volt battery to prevent it from dying. This switch access box was developed specifically for use with the Cognitive Behavioral Driver's Inventory. We do not know how altering the access method during this evaluation will affect the validity of the results. However, we hope that this access method will help some mobility-impaired clients receive accurate cognitive driving evaluations.